"I'm pleased to support the Society of Malaysian Contemporary Composer's proposal to organise the SMCC SoundBridge Contemporary Music Festival 2013. I have witnessed Malaysians with no prior interest in contemporary music being stimulated and interested as a result of previous SMCC performances, and I'm confident that this festival will boost the genre's profile even further. Furthermore, the festival's international participation will help strengthen cultural links and foster cooperation and healthy competition." 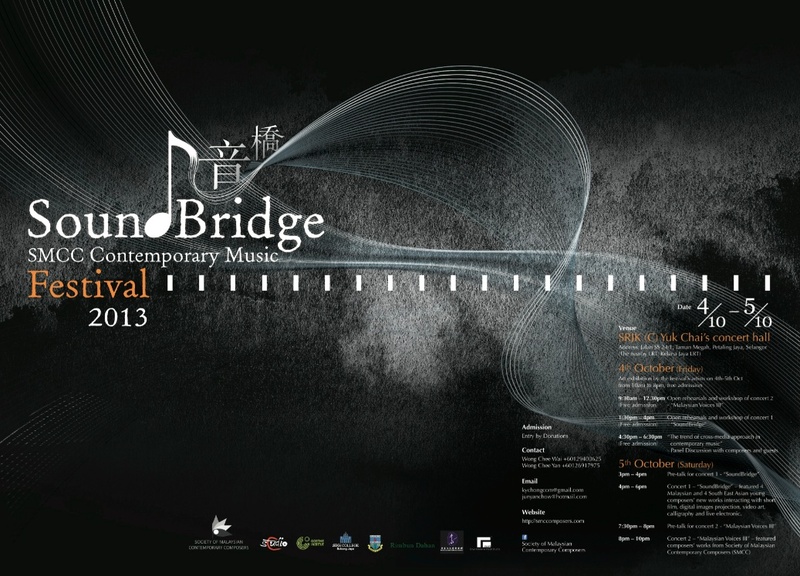 The Society of Malaysian Contemporary Composers (SMCC) and Studio C will be hosting the SMCC Contemporary Music Festival 2013, “SoundBridge” with two concerts on 5th October 2013. The two concerts will be held at SRJK Yuk Chai’s concert hall in Petaling Jaya. In addition, there will also be two open rehearsals comprising of composers’ workshops and a panel discussion on 4th October 2013 at the same venue with the Malaysian composers from SMCC, young guest composers from South-East Asia and international artists. The Festival Ensemble will feature local and international guests musicians and artists, including well-known musicians like composer/conductor Mr. Chong Kee Yong (Malaysia), pianist Dr. Nicholas Ong (Malaysia), composer/Chinese Dizi player Mr. Yii Kah Hoe (Malaysia), performance artist/Radio DJ Mr. Chong Keat Aun (Malaysia), zhong ruan player Ms. Ong May Yi (Malaysia), baritone Mr. Mak Chi Hoe (Malaysia), yangqin player Chee Sze Yau, Yang Qin, flutist Mr. Daisuke Kino-Shita (Japan), violinist Ms Saori Nakazawa (Japan), percussionist Max Riefer (Germany), and selected video/short film works by the video artist Mr. Chong Keat Aun (Malaysia), Ms. Sigrid Tanghe (Belgium), Mr. Pang Heng Khan (Malaysia), Mr. Joie Koo (Malaysia), Mr. Nelson Wong (Malaysia) and Mr. Mohammadreza Shams (Iran/Malaysia). This festival’s primary objective is to foster a deep intercultural exchange between Malaysia, Thailand, Singapore, Indonesia, Philippines and other international artists. Malaysia and SEA countries are with blossoming avant-garde music scenes, and SMCC & Studio C will help to forge a connection between them by introducing original music of local Malaysian composers and composers from SEA to the music scene of Malaysia. Our festival’s guests will share their expertise with local audiences and emerging composers during the festival. In this festival, we will also collaborate with selected young composers from Malaysia and SEA countries. One of the concerts will highlight multidiscipline art forms such as short film, black & white short film, digital images and live performance. These young composers will benefit from interaction with the festival ensemble, producing a high quality performance of their work and a professional video and audio recording of the concerts. In addition, a panel discussion titled ‘The Trend of Cross-Media in Contemporary Music’ will be held on 4 October at 4:30pm. The seminar will explore ways in promoting the interaction and collaboration between contemporary music and visual arts. The panel will comprise of Chong Kee Yong (Vice-chairperson of the Society of Malaysian Contemporary Composers/ SoundBridge Contemporary Music Festival Artistic Director), Yii Kah Hoe (Vice-chairperson of the Society of Malaysian Contemporary Composers), Mr. Bernard Goh (Artistic director of Hand Percussion), Miss Lin Yang Yi (Executive officer of Taiwan Music Institute/Composer/Art critic), Dr. Hoh Chung Shih (Singaporean composer), Dr. Ruth Rodrigues (Singaporean musicologist), William Lane (Hong Kong New Music Ensemble director), Miss Kok Siew Wai (KLEX festival director/video artist), Mr. Max Riefer (German percussionist) as well as the artists involved in this music festival. The invited guests will conduct a series of music workshops and rehearsals to engage creative and artistic dialogue with the local music students and audiences. A photography and calligraphy exhibition will also be held in conjunction with the event. At this juncture, I would like to express my deep appreciation to the many individuals and organisations who have contributed to the success of the festival, especially Tunku Zain Al-'Abidin Ibni Tuanku Muhriz, colleagues from the Society of Malaysian Contemporary Composers and Studio C, Rolf Stehle from the Goethe-Institut (Malaysia), Segi College Malaysia and for their assistance and help, the staff of Yuk Chai Primary School. A special mention also goes out to the participants and artists of the festival for their contribution and co-operation. Lastly, my deep appreciation goes out to my primary school classmate, Mr. Thor Hong Chuan, music supporter Mr. Chow Fong Ming and friends for their generosity and funding they have contributed in support of the festival.